We often expect our military heroes to come equipped with great athletic prowess and years of grueling training. A few ultramodern, nearly-magic gadgets and good looks don’t hurt either. Josephine Baker showed up with one of the four. On June 3, 1906, Freda Josephine McDonald was born in St Louis, Missouri. She was the daughter of a black American washerwoman, and, according to her foster son Jeanne-Claude Baker, her father may have been a white German-American for whom her mother had worked. When Josephine was eight years old, she went to work for a wealthy white family as a washer girl. According to her biography, the women of the house purposely burned her hands for using too much soap on the laundry. When Josephine was twelve, she quit school and became a homeless person. Josephine lived in cardboard boxes and scavenged food from trash to survive. Is it possible anyone who saw her scavenging for food in the alleys of St. Louis imagined that she would some day do great service to the Allied armies and the people of France during World War Two? At age thirteen, Josephine obtained a job as a waitress, and she married one of her customers, Willie Wells. By the time Josephine was fifteen, she had earned a reputation as a talented dancer, and she was able to support herself. She left Wells and quickly rose to the top of the Vaudeville dance circuit, spending the next six years entertaining American audiences. In 1921, Josephine married an American with the last name Baker. She kept that name for the rest of her life, though she divorced him. 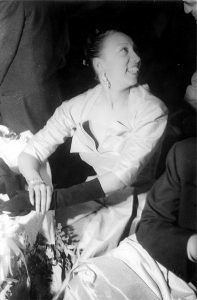 In 1925, Josephine traveled to Paris to perform for enthusiastic Paris audiences. She was an instant celebrity. France fell in love with Josephine, and Josephine fell in love with France. Josephine enjoyed greater integration in Paris than she could at home in the USA. She expanded her career to include movie acting, singing, and song writing. According to Ernest Hemingway, she was the most exciting woman in Paris. In 1935, Josephine returned to the USA to tour with the Ziegfeld Follies stage show. She had grown accustomed to something close to racial equality in France, and when she failed to “keep her place” in the United States, she generated mixed reviews. In 1937, Josephine returned to France. She soon married a Jewish French Industrialist named Jean Lion. By marrying Lion, she acquired French nationality. As World War Two approached, France contacted Josephine and asked if she would report on any interesting information that she picked up while attending parties, including some at European embassies. Josephine agreed. She quickly developed a skill for charming many fascist big wigs, who were desperate to cultivate an appearance of culture by being seen with her. When Germany invaded France, Josephine received brief emergency instruction in spy craft and was taught to use invisible ink and make safe information passes. During the Nazi occupation, Josephine was a prized commodity for parties and events held by Nazi and Italian fascist big shots. She was allowed to travel in and out of Vichy, France, Nazi-occupied France, and neutral countries such as Portugal and Switzerland. Josephine set up a theater and stage company in Marseilles, France and used it as a cover for a large espionage and sabotage organization. Refugees from Belgium and occupied France were taught to pose as stage artists, and the stage artists were taught to perform as spies. Her seemingly harmless musicians and actor types formed a valuable branch of the French Resistance. In 1941, Josephine was stricken with a bad case of pneumonia. She and some of her recruits traveled to North Africa seeking a dryer, warmer climate. Free French leader General Charles De Gaulle and his staff felt that Josephine had done more than her share and encouraged her to remain safely in French Colonial Africa to recover her health. Josephine was highly committed to the cause of freedom, and instead of remaining safe, she traveled to Morocco and set up an expanded espionage operation. From her base in Morocco, Josephine safely traveled back and forth to Spain to communicate with allied agents. She was able to assist the badly outnumbered US OSS agents in Europe in setting up improved communications. Josephine apparently was warned to keep her distance from the OSS because it was known that a mole was loose in their European operations. She had to know that she was taking a tremendous personal risk by working with both the multiple branches of the French Resistance and agents of the OSS. Whatever risk she sensed did not slow her down. Josephine suffered a miscarriage and received an emergency hysterectomy due to infection. The recovery rate from emergency hysterectomies at the time was astonishingly low; however, Josephine survived. The Free French Government ordered that she be transported to England and to a desk job. She refused her evacuation and remained active in the field until the defeat of the Axis powers in 1945. After the fall of the fascists, Josephine carried out one last, very personal mission. She traveled to Buchenwald and performed what must have been her single most important stage performance. She performed for the rescued death camp prisoners who were still too sick and weak to be moved. For her long and distinguished service in the war against Nazi tyranny, Josephine was decorated for bravery on three occasions. She received the French Croix de Guerre, the Rosette de la Resistance, and a knighthood from General Charles De Gaulle as a member of the order, Legion de Honeur. In 1951, when Baker was refused service at the Stork Club in Manhattan, Grace Kelly was in attendance and took exception. The future Princess Grace of Monaco took Josephine’s arm, and they stormed out together, followed by the rest of Grace’s party. Grace Kelly and Josephine became life long friends, and when Josephine and her large family of orphans faced financial trouble, Princess Grace gave her a palace and financial assistance. In 1963, Josephine was the only female to speak at the Civil Rights March on Washington D.C. After the assassination of Martin Luther King, she was offered and declined the leadership of King’s civil rights organization. She felt that her slew of young children needed her. Ten years after the March on Washington, Baker opened a show in New York at one of the world’s most prestigious venues, Carnegie Hall. Before the first note of the show could be performed, a packed house rose and gave her a very long standing ovation. The homeless orphan girl from the alleys of St. Louis had finally come home, and America had finally come home to her. On April 12, 1975, Josephine died of a cerebral hemorrhage. She was the first American woman to receive a military funeral with full honors. Twenty thousand French, Europeans, and Americans who had not forgotten her extraordinary service in the liberation of France joined her funeral procession. Without benefit of athletic prowess, much formal education, gadgetry, military or intelligence training, and armed with little more than her courage and commitment, the homeless girl from the alleys of St. Louis had made a difference in the world. Piper Bayard is an author and a recovering attorney. Her writing partner, Jay Holmes, is an anonymous senior member of the intelligence community and a field veteran from the Cold War through the current Global War on Terror. Together, they are the bestselling authors of the international spy thriller, THE SPY BRIDE. Watch for their upcoming non-fiction release, CHINA — THE PIRATE OF THE SOUTH CHINA SEA. Keep in touch through updates at Bayard & Holmes Covert Briefing. You can contact Bayard & Holmes in comments below, at their site, Bayard & Holmes, on Twitter at @piperbayard, on Facebook at Bayard & Holmes, or at their email, BH@BayardandHolmes.com. Excellent, Piper! We need more stories like this. Thank you! Good to see you. Thought of you the other day. My daughter has decided to double major in Geography and Religious Studies. Wow, that’s courageous! We really do need more people who understand religion. I was just posting on the topic on Goodreads this morning. This was a great post!